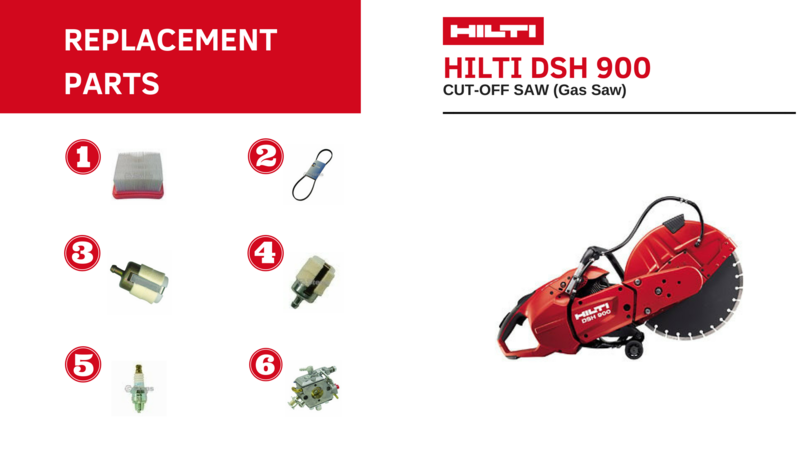 HILTI DSH 900 is a Hand-held gas saw with 87 cc engine and easy-start function, for cutting to depths of up to 150 mm (6"). This HILTI outdoor power equipment is ideal for cutting cutting metal, concrete and plastic pipes, bricks and blocks to size. Whether you need for your HILTI DSH 900, you have come to the right place. At Small Engines PRO Dealer, we carry an extensive variety of HILTI Aftermarket Parts including Belts, Air Filters, Carburators, and more. Shop with confidence and save money with us. Below this information, you'll find a complete list of replacement parts for your HILTI DSH 900. By using the list on this section, it is much easier for you to find the specific product you are looking for. Are you uncertain on what product you need? If you are uncertain on what product you need or are looking for your HILTI DSH 900, don’t worry! We have HILTI Techinicians ready to speak to you. Please email us at info@smallenginesprodealer.com and we will be happy to answer any questions. Also you can visit our Contact Section.